CE is a powerful liquid-phase separation technique that is an attractive alternative to HPLC because of its small sample requirements, high resolving power and excellent mass detection limits. While there are many similarities between the two techniques, there are also many differences, some obvious, some subtle. One of the often overlooked differences is the way sample is injected. In HPLC, injection is a very minor component of the method and the choice is predominantly restricted to the choice of solvent and the injection volume. But in CE, it is vastly more complex, and development of an appropriate injection strategy should be given consideration during any method development. 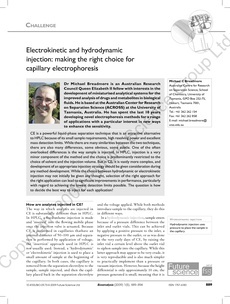 While the choice between hydrodynamic or electrokinetic injection may not initially be given any thought, selection of the right approach for the right application can lead to significant improvements in performance, particularly with regard to achieving the lowest detection limits possible. The question is how to decide the best way to inject for each application?